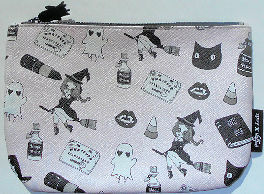 This pink cosmetic bag is decorated with cats, witches, bottles of magic potion, candy corn and more. The vinyl bag is 7 1/4" wide x 5" high. The bag is lined. Top zipper closure. New, sample.